A new analysis by Future Markets Insights gives an outlook on the paper recycling market for the next 10 years. Increasing urbanization and middle class population with surge in literacy rates in the developing countries such as India, China, and Brazil will create the huge demand for paper products such as newsprint, packaging, and writing paper. Also, changing consumer preferences towards convenient packaging solutions along with sustainability in mind will diminish the demand for plastic packaging and hence fuel the paper and paperboard industry. Despite being highly recyclable material, PET material is not yet recycled more than 30% of its annual consumption. Growing concern towards polymer-based products will not only diminish its future prospects but simultaneously increase the demand for paper and paperboard which is fully bio-degradable in nature. Recycling of paper has become a major trend in the paper and paper board industry, primarily due to unavailability or scarcity of the raw material. Recycled paper is the major source of the raw material for most of paper mills in the developing as well as developed countries. Recycling of paper not only saves more and more natural resources but also saves lots of manufacturing expenses. Primary applications for the recycled paper are the newsprint paper, printing & writing paper, and packaging products. More than 35% of the paper raw material demand in the countries such as India and China are fulfilled by the recovered paper. India imports a lot of recovered paper to meet its domestic demand due to lack of waste paper collection and segregation channels in the country. Increasing demand of the paper-based packaging products in the food and industrial markets will also brighten the future prospects of paper recycling business in the next few years. Packaging waste, if not recycled, may pollute the environment and create serious health problems. Paper recycling market has witnessed significant growth in the last few years due to increasing concern over depleting environmental resources. The demand for recycled paper is increasing at a CAGR of more than 7-8% annually in the developing countries. 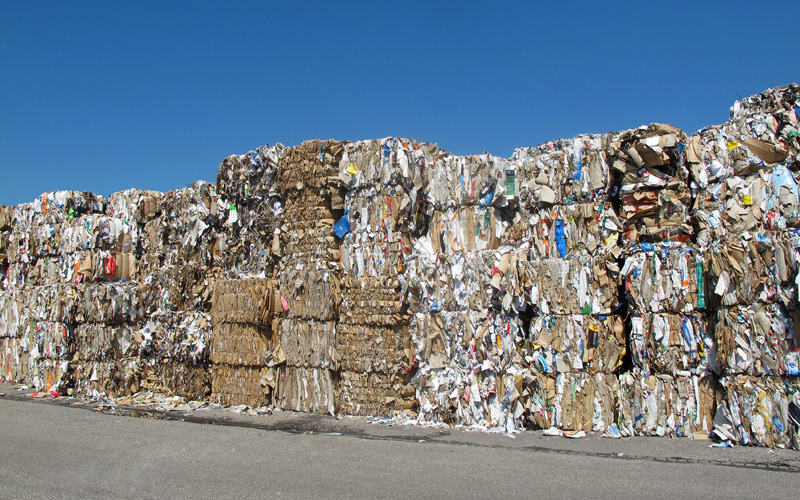 Major challenges in the paper recycling market is the high cost of machinery, inefficient waste paper collection and segregation system, and high competition from the international players. Primary focus of the local paper recyclers is to establish proper collection and segregation systems to facilitate the collection of the waste paper in the region. Leading recycling companies are establishing automatic and highly efficient recycling systems to curb high manufacturing cost and eliminate labor intensive operations by automating the existing process. There are lots of opportunities in the paper recycling market in the developing countries such as China because it is the leading importer of the waste paper in the world. This scenario could be reversed by the increase in domestic production of the recovered paper in the country. On the basis of region, the Paper Recycling market is segmented into seven regions which include North America, Latin America, Eastern Europe, Western Europe, Asia-Pacific, Middle East & Africa, and Japan. Approximately more than 57 million tons of paper is collected in the Europe for recycling activities. And the collection rate is steadily increasing, exceeding 50% every year. Also, more than 50% of the raw material demand in the Europe is fulfilled by the recycled paper. Newsprint, followed by packaging products, is the largest end use application of the recycled paper. Paper recycling market is growing but at a slower rate in developed regions than developing ones. Asia-Pacific and Latin America region has high potential for paper recycling market because of the lower paper recycling rates in the region along with the low penetration of the paper recycling companies in the region. Governments in countries such as India and China are also supporting paper recyclers to protect natural resources from depletion and increase recycling rates in the region. In MEA region, UAE and Saudi Arabia will soon ban plastic packaging products which will create the high demand for paper packaging products in the region. Escalating demand will also boost the demand for recycled paper in the region. Packaging is critical for enhancing the functionality of products as well as winning over new consumers. Of late, smart and sustainable packaging trends have gathered pace owing to busy lifestyles and rising per capita disposable income of consumers across the globe.